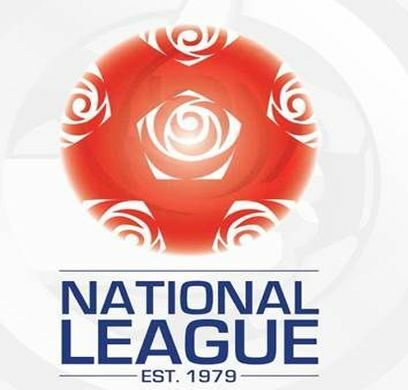 Vanarama National League: Exciting Future or Unnecessary Rebrand? The announcement on Easter Monday regarding the rebrand of the Conference has left me uncertain – and somewhat concerned – about the future of the top three divisions of nonleague football. This topic was talked about at length by myself on Non League Podcast episode 70, so if you have listened to that, this will be a rehash of some of that conversation. On the face of it, the deal seems brilliant. BT Sport will show more live games, and have signed a further three year deal. They will also launch a broadcasting academy and broadcast a weekly highlights show. All sounds great, until you read the statement on the matter. Then, questions and concerns come to the fore, and in no short supply either! Firstly, the new emblem: It’s bloody awful isn’t it? It has clearly been designed in a computer program, by somebody with absolutely no interest in, or enthusiasm for, football at any level. It smacks of corporate design, and is typical of a lot of rebrands these days. It will certainly strike a chord with supporters who have seen chairpeople and owners change their club’s badge (I’m a Huddersfield Town fan. Believe me, we’ve been through it). Secondly, the name. Vanarama National League. Seriously? It’s as bad as the new emblem! If that’s not bad enough, Step Two will now be known as Vanarama National League North and Vanarama National League South. Erm. What’s “national” about two divisions separated by geography?!? The whole announcement, quite frankly, leaves me cold. It is obviously due in no small part to the incoming chairman Brian Barwick. It can’t be a coincidence that this rebrand – which has come out of the blue somewhat – occurs at the same time as the head honcho changes. I am delighted to be joining at this vibrant time with this exciting new branding. It offers so much to our existing partners whilst at the same time opening up potential new opportunities. Really? It’s a name change. What exciting opportunities does that offer up? Maybe Mr Barwick is referring to the new broadcasting academy and television channel? On the face of it, both sound brilliant, but again all it does is raise questions in my head. While the academy will indeed offer exciting opportunities for its participants, and the new NLTV broadcasting platform could offer decent exposure, what effect will they have on the clubs themselves? We all know that clubs up and down the non league spectrum these days produce their own highlights for their fans – and anyone else – to watch on youtube for free, or to pass on to the manager and coaches for use in their coaching. However, what happens under this new situation? Will clubs still be able to film their own matches? Or will BT Sport now decree that if one of their academy students is coming to the game, then they are the only person allowed to film? In the same vein, the launch of NLTV and the highlights show will surely impinge on the member clubs? Either they will not be allowed to broadcast their own highlights, or at best maybe not until the Monday or Tuesday following a game. Either way, it’s not exactly an ideal situation for clubs – and their fans – to be put in. When all’s said and done, I am not happy with a television company being so influential in a league. It is all too reminiscent of the shambles going on at the top of our game, and I do not want any part of that coming into the Conference. The outgoing chairman, Mr Brian Lee, has done a stellar job during his tenure, and I worry that too much change is being brought as soon as he is on his way out the door. He may say publicly that he is excited about the future, but I can’t help wondering what he really thinks about all of this. Posted on April 11, 2015, in Opinion and tagged BT Sport, Featured, Vanarama National League. Bookmark the permalink. Leave a comment.